Genuine OEM HP Toner Cartridge, Black, 1,600 page yield. HP part number: CF217A, HP 17A. 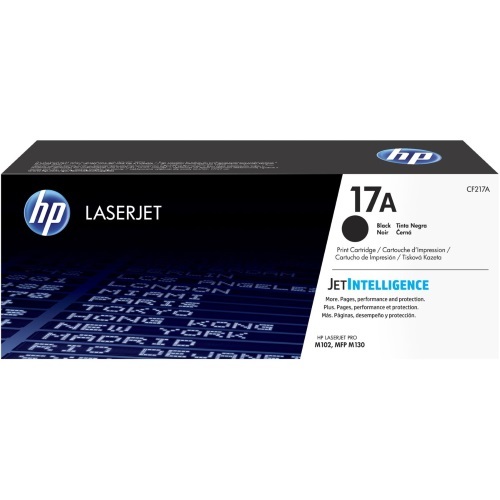 Laser Toner Cartridge compatible with HP LaserJet Pro M102w, MFP M130fw. Compatible HP Toner Cartridge, Black, 1,600 page yield. Replaces HP part number: CF217A, HP 17A. Laser Toner Cartridge compatible with HP LaserJet Pro M102w, MFP M130fw. Compatible HP Imaging Drum, 12,000 page yield. Replaces HP part number: CF219A, HP 19A. Imaging Drum compatible with HP LaserJet Pro M102w, MFP M130fw.